In English law, a writ which commands witnesses to come into court and to give testimony. Scripture (Lev. v. 1) makes it the duty of any one who has seen or heard things which are material to the right decision of a lawsuit, whether civil or criminal, to come forward and testify; otherwise he will "bear his iniquity." Further, it contemplates that the party interested in the case will proclaim publicly what testimony he needs, and will lay his curse on those who are able to give such testimony but who fail to do so. 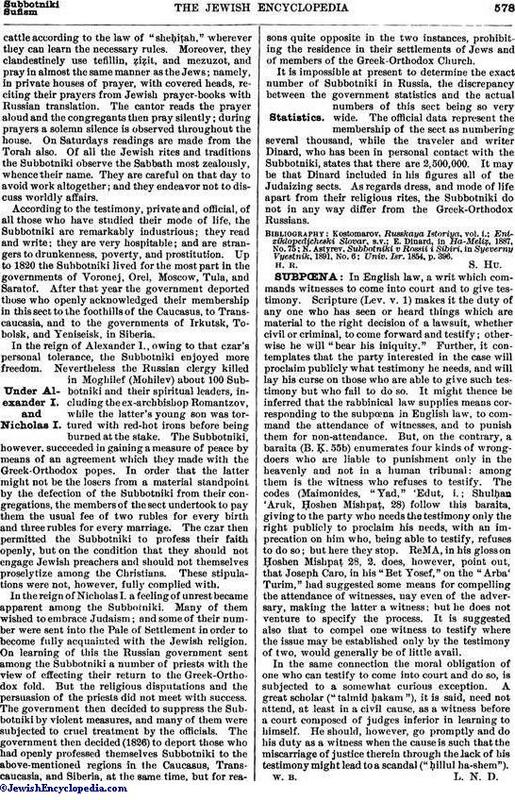 It might thence be inferred that the rabbinical law supplies means corresponding to the subpœna in English law, to command the attendance of witnesses, and to punish them for non-attendance. But, on the contrary, a baraita (B. Ḳ. 55b) enumerates four kinds of wrong-doers who are liable to punishment only in the heavenly and not in a human tribunal: among them is the witness who refuses to testify. The codes (Maimonides, "Yad," 'Edut, i.; Shulḥan 'Aruk, Ḥoshen Mishpaṭ, 28) follow this baraita, giving to the party who needs the testimony only the right publicly to proclaim his needs, with an imprecation on him who, being able to testify, refuses to do so; but here they stop. ReMA, in his gloss on Ṭoshen Mishpaṭ 28, 2, does, however, point out, that Joseph Caro, in his "Bet Yosef," on the "Arba' Ṭurim," had suggested some means for compelling the attendance of witnesses, nay even of the adversary, making the latter a witness: but he does not venture to specify the process. It is suggested also that to compel one witness to testify where the issue may be established only by the testimony of two, would generally be of little a vail. In the same connection the moral obligation of one who can testify to come into court and do so, is subjected to a somewhat curious exception. A great scholar ("talmid ḥakam"), it is said, need not attend, at least in a civil cause, as a witness before a court composed of judges inferior in learning to himself. He should, however, go promptly and do his duty as a witness when the cause is such that the miscarriage, of justice therein through the lack of his testimony might lead to a scandal ("ḥillul ha-shem").